In Royce Hart, Michael Roach, Matthew Richardson and Jack Riewoldt, Richmond’s forward line has featured a Tasmanian as its focal point for most of the past 50 years. We honour the second of this illustrious quartet as an Icon of Tasmanian football, a goal-kicker of exceptional skill and athleticism known universally as ‘Disco’. Born on October 9th 1958, Michael Roach grew up in the small town of Westbury in the state’s north. A talented junior sportsman, he represented the Tasmanian U16 Schoolboys team in 1974, and it was at this time that he was first noticed by VFL club Richmond. In early-1975, Roach was enticed across Bass Strait by the Tigers to live in Melbourne, however, after only six weeks Roach decided to return to Tasmania, subsequently lining up with Longford for the 1975 NTFA season. Roach’s two seasons of senior football with Longford were an enormous success, topping the club goal-kicking in both years and being chosen to represent the NTFA and Tasmania. At the end of 1975, Roach finally signed with Richmond, however he opted to remain with Longford for another season before heading to Punt Road. Tall and skinny when he arrived at Richmond in 1977, Roach initially played as a wingman. He made his senior debut in Round 8 – one of nine senior appearances for the year – and finished the season as a member of Richmond’s reserves premiership team. After his 1978 season was ruined by injury, Roach was encouraged by coach Tony Jewell to work on his physical strength, believing that Roach had the makings of a promising full-forward. soaring mark over several opponents, an effort which saw him win Mark of the Year. Late in the year Roach became one of a select few footballers to represent two states in the same season, when he turned out for Tasmania at the State of Origin Carnival in Perth. With nine goals in three matches, Roach was the tournament’s leading goal-kicker, and was subsequently chosen in the All-Australian team. From 1979-81, Roach was the stand-out full-forward in VFL football, kicking 288 goals across the three seasons. His single greatest season was certainly 1980, booting 107 goals to claim the Coleman Medal and becoming only the second Tiger to cross the 100-goal barrier. Despite a relatively quiet finals series, he nevertheless went on to play a crucial role in the Tigers’ premiership triumph. He also again represented both Tasmania and Victoria, booting 7 goals in the Big V’s win over Queensland. After a second Coleman Medal in 1981, Roach was surprisingly replaced as Richmond full-forward in 1982 by young recruit Brian Taylor, who had dominated the reserves in the previous two years. Only one of Roach or Taylor could play deep forward permanently, so it was decided to utilise the more versatile and athletic Roach as a roaming ruckman. From 1982-84 Roach played much further up the ground and made only occasional forays deep forward, such as when Taylor was injured for much of the back half of 1982. 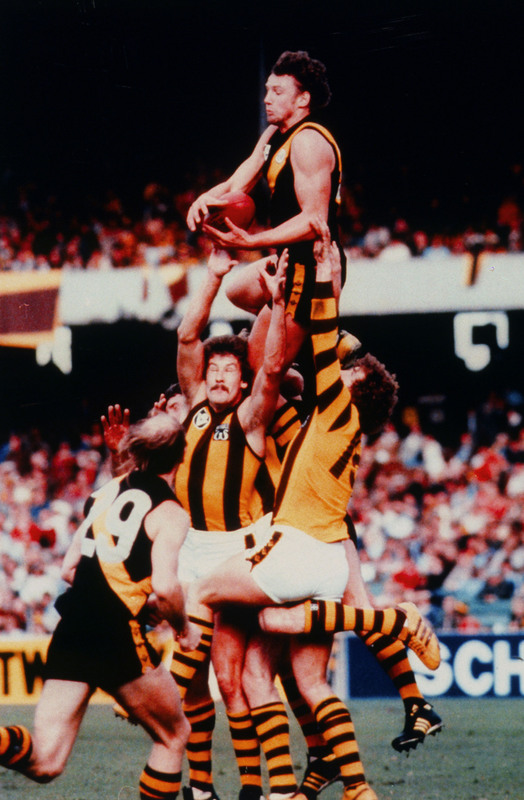 At the end of 1984, Taylor became one of the myriad of players to move between Richmond and Collingwood, and Roach was able to reclaim his mantle as the Tigers’ main spearhead. He wasted no time proving that he was still a force in the position, booting 80 goals in 1985 and 62 in 1986. By now Richmond were a side on the wane, however in Roach they still had a player who could match it with any opponent. Roach’s remarkable success as a goal-kicker can be attributed to his possession of every trick in the key forward trade: his great athleticism allowed him to best opponents whether on the lead or one-on-one, and this combined with his strong hands made him one of the best contested marks in the game. Once he had ball in hand, Roach was a penetrating kick and was noted as an extremely reliable set shot, having very few genuinely poor games in front of goal across his whole career. Additionally, Roach was a key forward ahead of his time, known for passing to teammates in better positions and kicking on his non-preferred foot. Sadly, Roach’s final years at VFL level were blighted by injuries, including severe back and Achilles issues. Now out of favour as first-choice full-forward, Roach played only three games in 1988 before bowing out of VFL footy with seven games in 1989, the exact number he needed to reach 200. He retired with 607 goals in the yellow and black, then third all-time for Richmond behind Jack Titus (970) and Kevin Bartlett (778). Post-playing career, Roach maintained close ties to Richmond, serving at various times as skills coach and reserves team manager during the 1990s, while also being a prominent member of the ‘Save our Skins’ campaign which saved Richmond from bankruptcy. Had he played at full-forward for the entire prime of his career, Michael Roach could well have been spoken of as one of the all-time great key forwards. An enormously popular figure within football circles, his on-field contributions have been recognised with inclusion in both the Tasmanian and Longford Teams of the Century, and his omission from Richmond’s own team was controversial. Without question one of the finest footballers ever to have emerged from Tasmania, it is fitting that Michael Roach is now acknowledged as an Icon of Tasmanian Football.